In body form and size, the coyote (Canis latrans) resembles a small collie dog, with erect pointed ears, slender muzzle, and a bushy tail (Fig. 1). Coyotes are predominantly brownish gray in color with a light gray to cream-colored belly. Color varies greatly, however, from nearly black to red or nearly white in some individuals and local populations. Most have dark or black guard hairs over their back and tail. In western states, typical adult males weigh from 25 to 45 pounds (11 to 16 kg) and females from 22 to 35 pounds (10 to 14 kg). In the East, many coyotes are larger than their western counterparts, with males averaging about 45 pounds (14 kg) and females about 30 pounds (13 kg). Coyote-dog and coyote-wolf hybrids exist in some areas and may vary greatly from typical coyotes in size, color, and appearance. Many are black, and some are reddish. 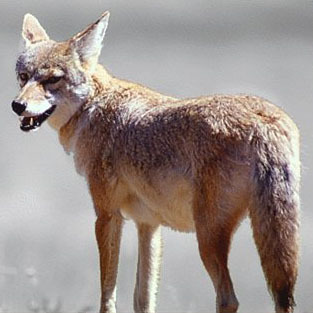 Coyotes often include many items in their diet. Rabbits top the list of their dietary components. Carrion, rodents, ungulates (usually fawns), insects (such as grasshoppers), as well as livestock and poultry, are also consumed. Coyotes readily eat fruits such as watermelons, berries, and other vegetative matter when they are available. In some areas coyotes feed on human refuse at dump sites and take pets (cats and small dogs). Coyotes can cause damage to a variety of resources, including livestock, poultry, and crops such as watermelons. They sometimes prey on pets and are a threat to public health and safety when they frequent airport runways and residential areas, and act as carriers of rabies. Usually, the primary concern regarding coyotes is predation on livestock, mainly sheep and lambs.